We strongly recommend using the cover to prevent older chicks from perching on top of the plate and keeps top of plate clean. Uses 22 watts/hr. The bottom-side of the heating plate reaches approximately 125 degrees when fully heated. Allow the plate 1 hour to heat the unit before placing the chicks under it. As the chicks grow, increase height of the plate above the bedding with the adjustable push-button legs. Plate is more effective when chicks can just touch the plate, especially when they are newly hatched. Warms up to 20 chicks. 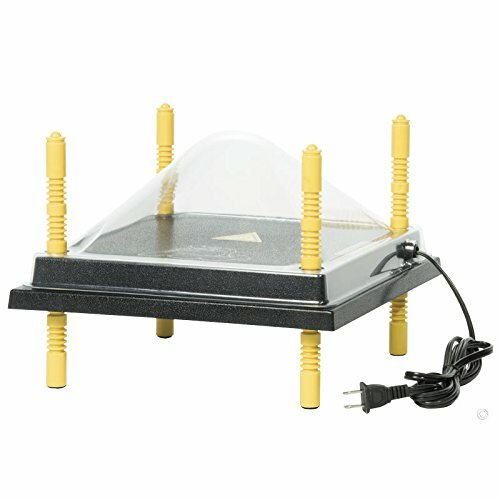 Heating plate is made of ABS plastic and polyurethane insulation and cover is heavy transparent plastic. Requires 110 volt outlet and has 70" length cord. 1 year limited warranty on the electric heat plate unit. A heating plate simulates a hen keeping chicks warm and cozy beneath her feathers. Chicks stay warm by contact with warm underside of the plate. The bottom-side plate surface reaches approximately 125 degrees when fully heated. Warms up to 20 chicks. Requires 110 volt outlet and uses 22 watts per hour.